The soul is the core of an individual. It is an aggregate of energies that define our individual characteristics. 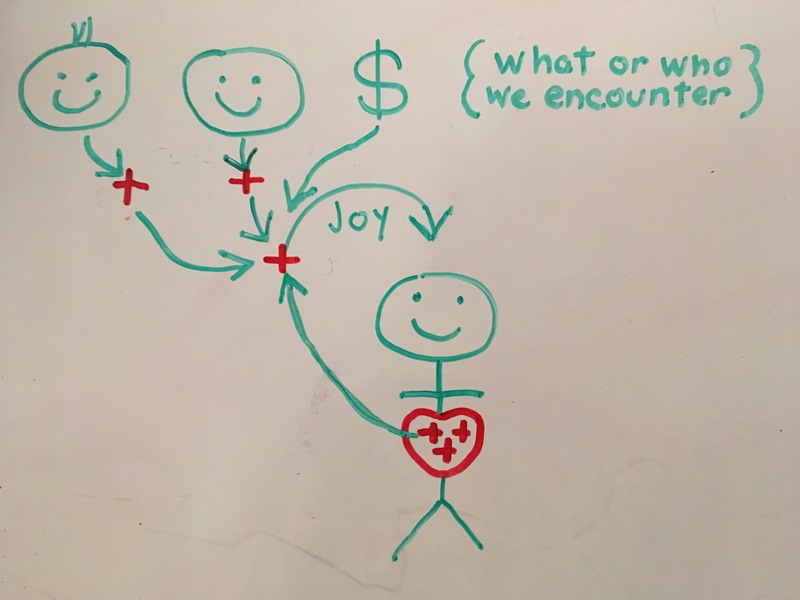 The soul is an amalgam of positive energies; by itself it brings upon joy to us because of these positive energies (see figure 1-1). There is “Good” in everyone because of our original pure soul; but our souls have accumulated negative energies around them. This is why we suffer (see figure 1-2). Where do these negative energies that surround the soul come from, and how do we remove them? Let us further explore the soul/heart. 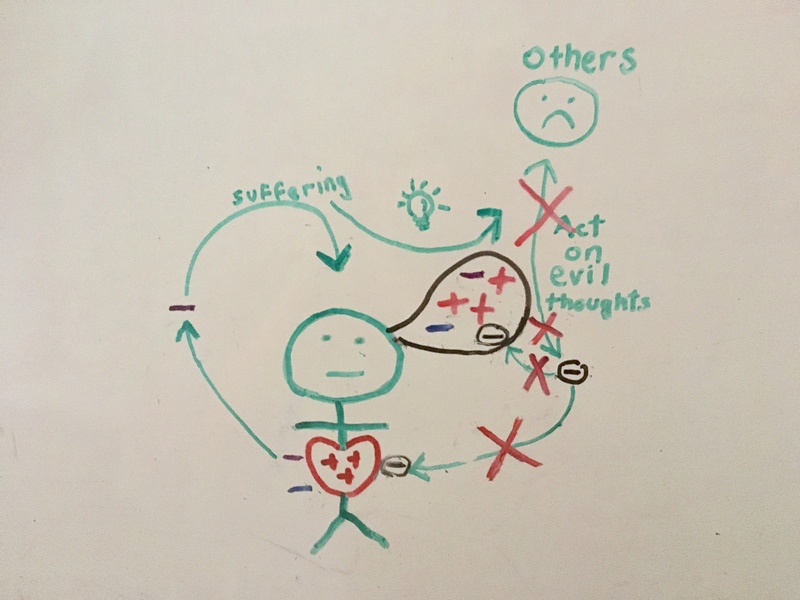 During our earthly stays, the soul helps remove our evil thoughts that are produced in our minds; and stores them as negative energies (see figure 1-4). 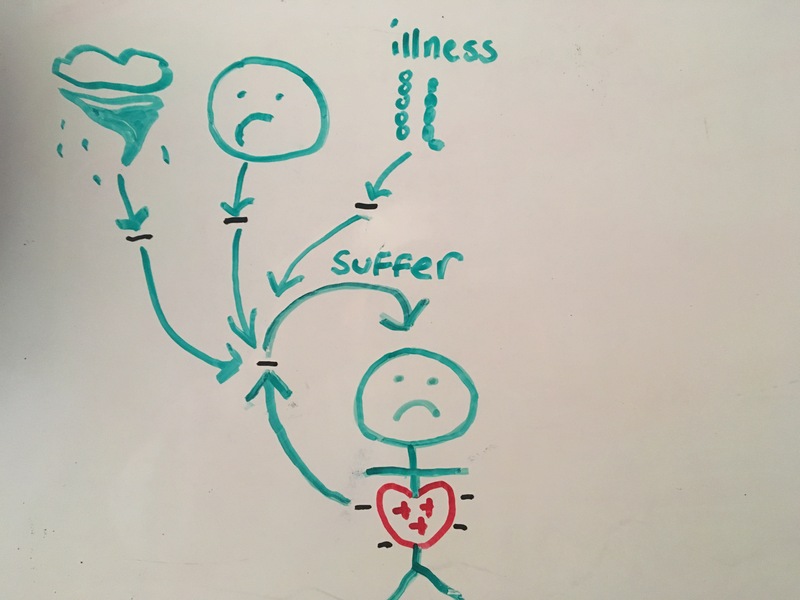 The soul eventually releases the negative energies and redirects it back to us (see figure 1-5). What do these negative energies manifest into? 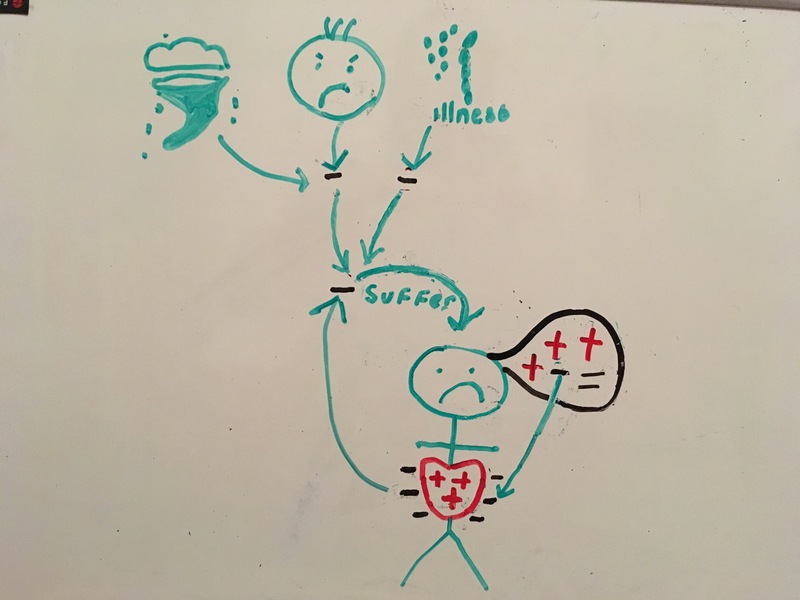 These negative energies that surround the soul manifests into sufferings, temptations and inconveniences that come back to us as fate on this earth (see figure 1-6). The biblical proverb, “We reap what we sow” would appear to be true. What happens to these negative energies surrounding the soul when we die? Death does not take away these negative energies. The soul ascends to heaven with these deficiencies, and returns when an appropriate environment and housing are chosen for each unique soul. 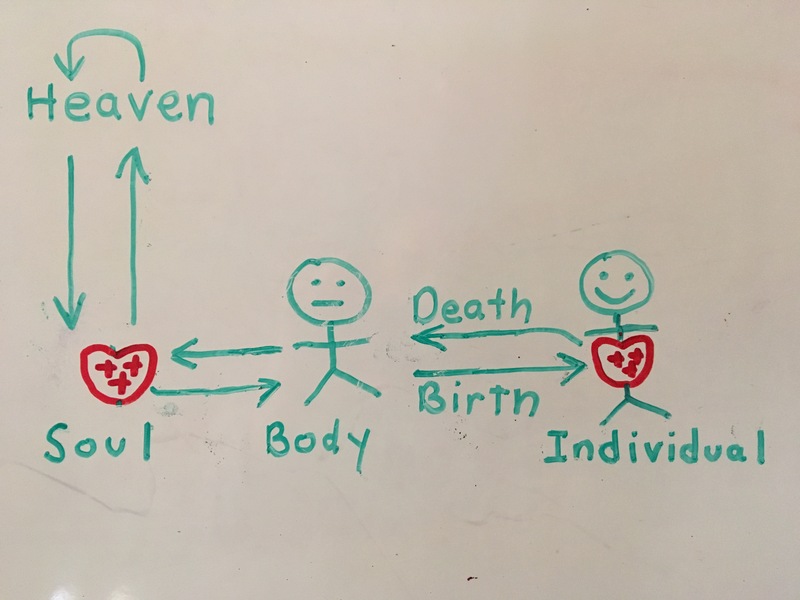 When the soul enters our developing bodies, some of the negative energies around the soul converts back into our former negative thoughts, and settles in our minds (see figure 1-7). The process of death erases our past memories; but it does not erase our evil thoughts. This will explain the appearance of anger and greed in our precious and innocent children. Most important, the negative energies around the soul will manifest as inconveniences in our lives. By these inconveniences that the soul delivers, they gives us opportunities to eliminate the production of evil thoughts from our minds; these inconveniences work to remind us of the evils in our minds. These evil thoughts are greed, arrogance, miserliness, hate, anger, revenge, covetousness and self-love. 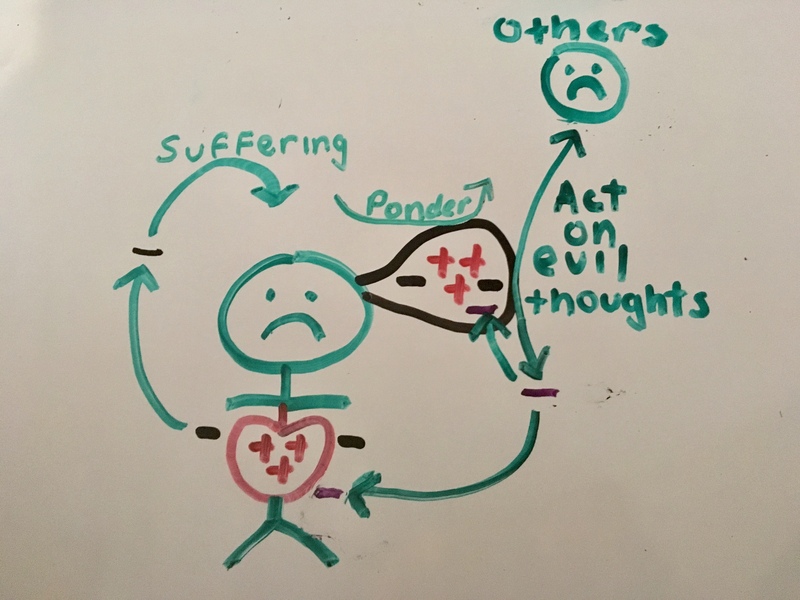 These evil thoughts when placed into action causes sufferings to others; but unknown to most of us, they also brings upon suffering back to the perpetrators of the evil actions as a result of the actions of the soul. 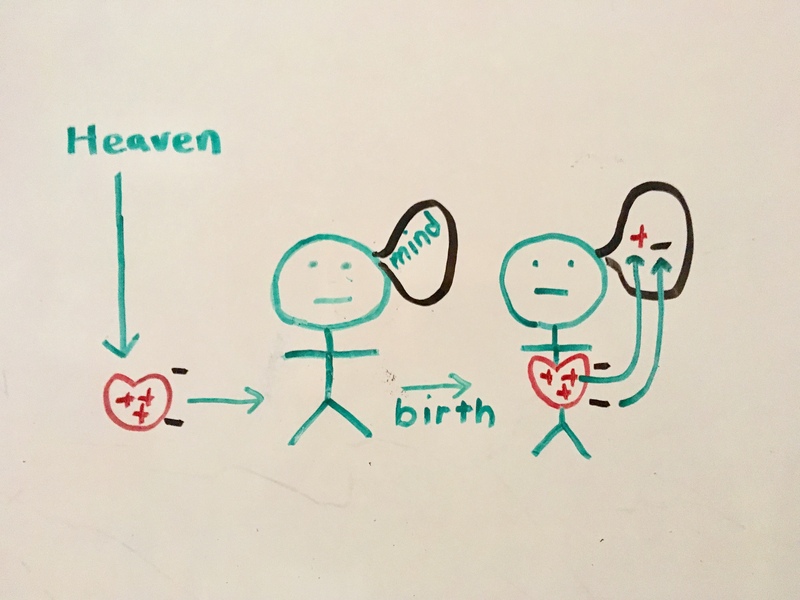 How does the soul eliminate evil from our minds? If we calm our minds and ponder the existence of evil thoughts in our minds; and do not act on them when faced with what the soul metes out (sufferings, inconveniences and temptations), these thoughts from our minds gradually subside. We do not produce more evil thoughts (see figure 1-8). Our minds becomes pure, and the evil surrounding our souls are eliminated. This results in a pure soul void of negative energy, which brings upon a joyous life for the individual. For many people, the purification of the mind will be a long process, dependent on the amount of negative energy they have accumulated around their soul (Ofudesaki 1-47), which is also equivalent to the amount of evil thoughts in their mind. These sufferings that the negative energies manifest will test their resolve of not taking action on their evil thoughts. But if they continue to control their evil thoughts by not acting on them, the production of evils in their minds will be eliminated. There is a saying that from knots (sufferings), buds (opportunities to remove evil thoughts) will sprout if we understand the soul. But suppose we do not understand what the soul does? 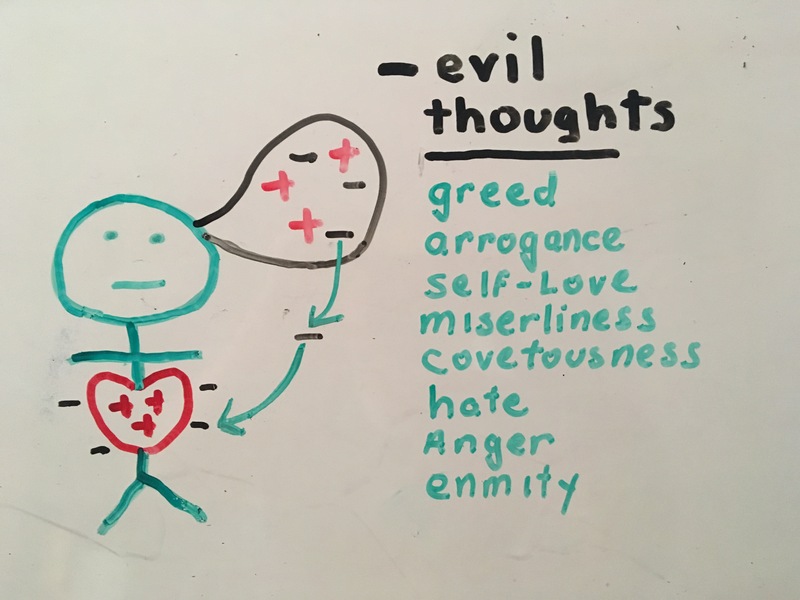 If we act on our evil thoughts when the soul distributes its negative energies or even if we act on them without the soul’s message, others will suffer and our minds will continue to produce more negative thoughts. This increases the negative energy surrounding our pure soul, causing the soul to bring upon more suffering upon ourselves (see figure 1-9). From knots, knots will continue to sprout if we do not understand the soul. Do not ignore the manifestations of the soul. This is why we must not blame others for any inconveniences or sufferings; these setbacks are manifestations of our own souls. We must look within our minds to understand why the soul brings upon sufferings, temptations and inconveniences. This entry was posted in Christianity, Heaven's Truth Church, Hinduism, karma, soul, Tenrikyo and tagged christianity, heaven's truth, heaven's truth church, Hinduism, soul, TENRIKYO. Bookmark the permalink.